Chondrichthyes is the name given to the cartilaginous fishes, and includes the Elasmobranchs (sharks, skates and rays) and the Holocephalans (chimaeras). Among the many differences between these two groups, which diverged from a common ancestor more than 400 million years ago, is the structure of their gills and how they develop in the embryo. Chimaeras develop four gills with a single external gill opening that is covered by a flap called an operculum, while sharks develop between five and seven external gill slits and have no operculum. All vertebrate embryos begin building parts of their face, neck and related structures by forming a series of small pouches of tissue called the pharyngeal arches. Sharks and rays use some of these pouches to form the cartilaginous support structures for their gills, they become the gill arches. As the shark embryo develops, projections grow perpendicularly out of these arches and form the branchial rays that separate and support the gills. Elasmobranchs make branchial rays on most of their arches, while chimaeras make them only on the most anterior arch (the one closest to the head), which will form the operculum, but not on the posterior gill arches. A classical evolutionary question has been how and when these differences arose during Chondrichthyian evolution, and what the common ancestor of Elasmobranchs and Holocephalans looked like. Did sharks gain additional branchial rays after they diverged from a common ancestor who had a chimaera-like pattern, or did chimaeras lose most of their branchial rays after diverging from a common ancestor who had a shark-like pattern? One way to answer this question would be to examine fossilized Chondrichthyians that lived before the split between Elasmobranchs and Holocephalans occurred, but cartilaginous skeletons fossilize poorly, and the fossil record is quite thin. New work by Gillis et al instead takes a developmental biology approach to this evolutionary question. Studies have shown that embryos often preserve vestiges of ancestral structures that no longer develop in adult animals. As the authors mention, some snakes and whales for example show small vestigial limbs, remnants of their limbed ancestors. Comparing limbless animals and their limbed relatives, researchers have found changes in the expression of a small number of genes that function to produce elongated body parts. One of these is the interestingly named Sonic Hedgehog gene. Yes, that is the name of a real and quite important gene. Briefly - by way of explaining how some genes come to have odd names - mutating a Drosophila gene identified in 1980 produced fly embryos that were unusually round and spiky. The mutant fly, and the mutated gene, were named Hedgehog for the apparent similarity. When the vertebrate counterpart of this gene was found some years later, the researchers that discovered it wanted a jazzier name (and perhaps had been playing too many video games), and it was named Sonic Hedgehog (abbreviated Shh). Back to Chondrichthyians, the shark version of Shh is expressed in the branchial rays of developing embryos. 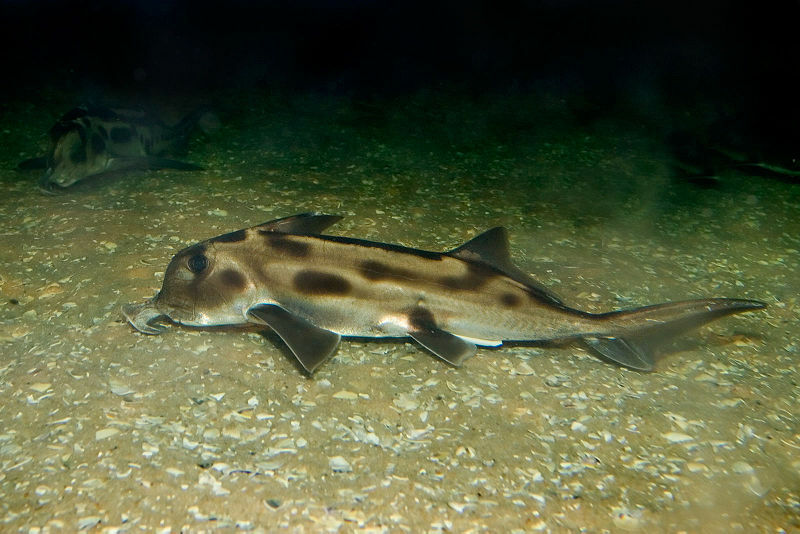 Gillis et al compared Shh in the embryos of an Elasmobranch, the small-spotted catshark, Scyliorhinus canicula, and a Holocephalan, the elephant shark, Callorhinchus milii. They found Shh in the growing branchial rays of five gill arches in S. canicula, and expected to find it in the first gill arch of C. milii, but not in the more posterior arches that do not make rays. Instead, they found something even better - the answer to an evolutionary riddle. The posterior gill arches of C. milii had spots of Shh where the rays should form, if they were going to be made, and each Shh spot actually produced a tiny bump of cartilage, but these never developed further. So elephant sharks have lost the ability to make posterior branchial rays, but still carry the embryonic pattern for where they should form. It seems the common ancestor of Elasmobranchs and Holocephalans had the gills of a shark, rather than the gills of a chimaera. Photo: An elephant shark showing the operculum covering its gill slits (from http://fishindex.blogspot.com/).